This year, like every year, our task force started 2019 by reevaluating our goals. Since it was formed in 2010, the Cook County Human Trafficking Task Force has brought folks from a variety of perspectives to the table to address the issue of human trafficking. Our multidisciplinary task force partners collaborate to pursue justice for survivors, to ensure that the various systems with which survivors regularly engage have the capacity to respond, and to ensure that quality social and legal services are available to them at every juncture. Lyft Driver Community Learning Opportunity! In December of 2016, Keith Avila picked up his first passengers for the night. But something wasn’t right. He quickly noticed a young girl with two older passengers, who during their time in the car, proceeded to coach her as they drove to a nearby hotel. As soon as he dropped them off, Keith decided to call the police. His vigilance helped the girl reunite with her family – and highlighted a critical place for identification of the crime of human trafficking, which takes place in all 50 states, including Illinois. In an effort to be like Keith, we want to bring you up to speed on what human trafficking really is, how it can be identified, and what you might do to respond if you notice something fishy in your backseat. This free 1-hour workshop will give you practical tips on what to look out for when driving. You don't want to miss out on this unique learning opportunity! The parking lot is free, if available, but non-metered street parking is also available. Join our special network of service providers to address human trafficking! you to join the Coordinated Service Referral Network! Are you a direct service provider or advocate who provides specialized services to vulnerable populations? Do you think you've encountered a survivor of human trafficking in your program before? Would it have been helpful to have more resources to address human trafficking? Our solution: Join a network of human-trafficking-informed providers in a variety of service categories. Then, gain access to a database of safe referrals and resources. 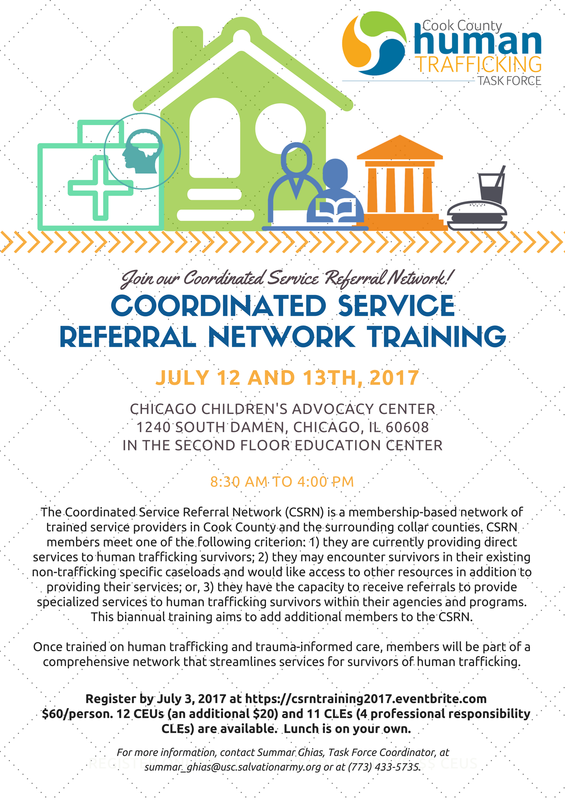 The Coordinated Service Referral Network (CSRN) is a membership-based anti-trafficking network of trained service providers in Cook County and the surrounding collar counties. CSRN members must meet one of the following criterion: 1) they are currently providing direct services to human trafficking survivors; 2) they may encounter survivors in their existing non-trafficking specific caseloads and would like access to other resources in addition to providing their services; or, 3) they have the capacity to receive referrals to provide specialized services to human trafficking survivors within their agencies and programs. This biannual training aims to add additional members to the CSRN. Once trained on human trafficking and trauma-informed care, members will be part of a comprehensive network that streamlines services for survivors of human trafficking. 12 CEUs (an additional $20) and 11 CLEs (4 professional responsibility CLEs) are available. Lunch is on your own. Register here by September 11, 2015. For more information on CSRN Membership, contact Summar Ghias, Task Force Coordinator, at summar_ghias@usc.salvationarmy.org or at (773) 433-5735.